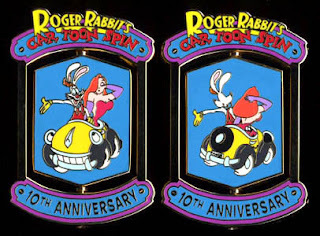 In 2004, the Roger Rabbit's Car Toon Spin ride celebrated its 10th Anniversary. 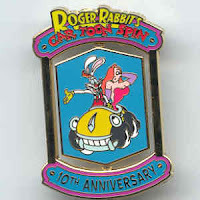 This special pin was a spinner featuring Roger, Jessica and Benny the Cab. The blue center portion of the pin could be turned to show the front and back side of the characters. The Car Toon Spin logo is above.